Splish and splash with the Cat in the Hat all week long during THE CAT IN THE HAT KNOWS A LOT ABOUT THAT! 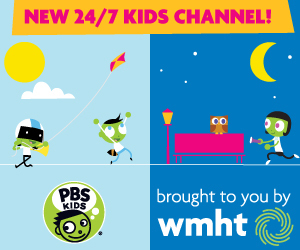 "Let's Get Wet Week" coming to WMHT on Monday, July 22, 2013 through Friday, July 26, 2013. Play fun learning games and watch The Cat in the Hat Knows A Lot About That anytime at pbskids.org. Nick and Sally learn how to wrap a present; and try to catch a frog that's in their pool. The Cat takes the kids to the International Space Station to teach them about the solar system and Earth's orbit around the sun. Later, with help from his pal Hilda the Hippo, he teaches them about the importance of sunscreen. Nick and Sally learn to swim slowly from a manatee and her son; Nick and Sally help make chocolate. Nick and Sally wonder which animal is the toughest; the Cat helps Ting Tang Tony return to his family. Nick and Sally search for a missing guinea pig. Later, at Splishy Splashy Pond, the kids learn how to stay on top of water from Walker the water strider.